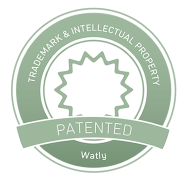 Watly purifies water from any source of contamination being chemical, physical and bacteriological. It efficiently desalinates ocean water, eliminates all pathogens and microorganisms from previously polluted water, including viruses, bacteria, parasites, fungi or cysts; it removes organic and inorganic compounds as well as liquid contents of latrines and poisons such as arsenic, benzene, heavy metals (lead, mercury), chlorine, chloramines, and radionuclide. 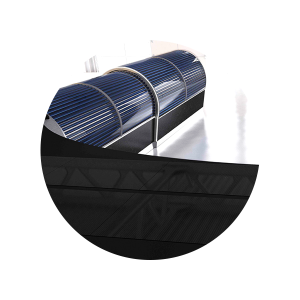 Watly is composed of thermal solar power units, with each unit equipped with an “arch shaped” array of thermal solar vacuum tubes. Each power unit integrates an extendable telescopic wing that is closed during transportation. Watly’s thermal panels are super-efficient and extremely resistant. 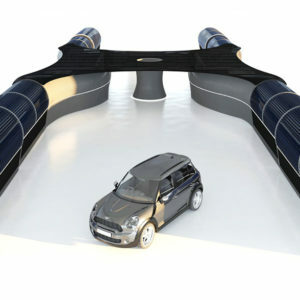 Watly’s unique “arch shape” allows the thermal tubes to be optimally exposed to incident solar irradiation during the whole day. The solution emulates the advantages of a moving sun-tracker but is extremely simple and reliable in the long term. Watly multiple-stage purification process is based on vapor compression distillation, galvanization and graphene technology. It does not need filters or membranes. It has by far the most effective and powerful method of water purification available. In terms of efficacy, it outperforms reverse osmosis, nano-filtration or ultraviolet purification methods. Accredited laboratory results confirm that the water quality of Watly is outstanding, absolutely pure, low mineralized and with a perfect pH balance (6.8 – 7.2). These chemical properties of the water produced by Watly are fine tunable according to the users’ preferences, tastes and legislation. Watly has a pH-regulating internal system which is far more flexible than any filter technology. Our water also passes through an ionization process which ultimately delivers the highest quality water standard possible (in some cases better than commercial waters sold at the supermarket). Watly’s water output does not depend on the kind of water input. No matter how much the water feeding Watly is polluted, the result is always the same: clean water. This is the main advantage compared to other purification/desalination methods such as reverse osmosis. Watly does not use filters or membranes (which eliminates the need of substitution and risk of fouling and/or breakdowns). Watly does not needs chemicals such as membrane cleaners, scale inhibitors, antiscalants, corrosion inhibitors, biocides, disinfectants, de-chlorinators and flocculants. Watly does not destabilize the molecular structure of water; it simply re-formats it to its natural pure energetic status. Polluted water enters the system automatically by using high-efficiency solar pumps. We are talking about any kind of polluted water: from ocean water, lakes, rivers, ponds, or even sewage water. Through a cutting-edge galvanization and graphene based technology, water is separated from soaps, solvents and hydrocarbons. Water flows into another storage tank where it is preheated. The system that provides the extra heat simultaneously cools down the photovoltaic panels by means of a heat exchanger. The system allows photovoltaic panels to work at the optimal Nominal Operating Cell Temperature of 25ºC which increases panel efficiency by 40-50%, even under the hottest environmental conditions. The extracted heat directly increases the temperature of the inlet water to 50-70ºC. The pre-heated water is pumped into the main distillation unit, where it is heated to boiling point and then evaporated. The vapor is then mechanically compressed to increase its temperature and is subsequently condensed by being conveyed in an exchange circuit designed to transfer the latent heat of condensation to the inlet water. Under these conditions, the water temperature can reach 115ºC. The system ensures a thermal efficiency well above normal standards. The process removes salt, bacteria, virus, fungi, parasites, cysts, pesticides, arsenic, benzene, alcohol, endocrine disrupting compounds, medical, residues and heavy metals, liquid contents of a latrine with efficacy of >99.999999% (log 8). Once distilled, purified water flows in a special mineralizer and acid reducer, which regulates water pH and minerals at optimum levels. This system employs a proven and reliable technology, based on the use of specific mineral mixtures. The solution has been designed to last for +10 years without the need for maintenance or substitution. The system is remotely controllable, so that water quality output is always strictly monitored. At this stage, the water is perfect for human consumption. It is stored and preserved in a special tank equipped with UV lamps that guarantee +10 days water storage without risk of proliferation of algae or bacteria. The water delivered by Watly is absolutely pure, low mineralized and it comes with a perfect pH balance (6.8 – 7.2). 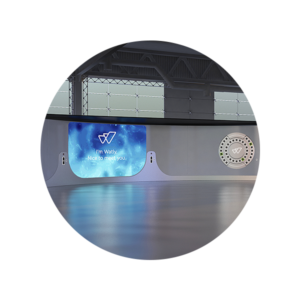 The water is delivered to end-users through multiple interactive stations located on the interfaces of the Central unit. A special water filling system, automatically fills-up each W-Tank in 15sec. Residues from the distillation process that might include salt, small rocks, sand, inorganic compounds, liquid poison, heavy metals become a concentrated brine. The brine is dumped automatically into a special tank, which can collect the residues produced during +15 days of normal operations. Once the storage tank is full, human intervention is required to properly dispose of residual. A special arrangement of pipes prevents possible clogging problems, no matter how viscous and dense the brine is. The ratio water input/water output is 99.5% which is extremely important when the water is not just contaminated, but also scarce (it is worth mentioning that reverse osmosis ratio is 30-50%). It does not need to be connected to an electric grid. Watly produces off-grid electricity to power its own internal electronics (computers, multiple-screens, drones landing pads, 3D printers and different telecommunication devices), as well as external devices (portable computers, mobile phones, portable lamps, radios, televisions, household appliances). On top of the central unit is a solar roof with its array of mono-crystalline photovoltaic panels. Watly photovoltaic panels are cooled so that they can work at the optimal Nominal Operating Cell Temperature of 25ºC. This increases panel efficiency by 40-50%, even under the hottest environmental conditions. Watly generates both AC/DC currents in full compliance with all applicable standards and regulations. The energy in the form of electricity is stored in a salt/water based internal batteries or alternatively hydrogen fuel cells (which guarantees unlimited recharging cycles). Watly’s internal electronics are protected in a special compartment provided with an innovative temperature controlling system based on Peltier-cells. 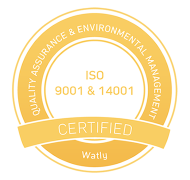 Watly’s electrical components are among the top rated on the market in terms of reliability and performance. The class of protection adopted ensures total protection against dust and water. Watly is a powerful communication device capable of collecting and sending any kind of data (videos, images, audios, texts, ratios, etc.) to the Internet as well as to any other compatible communication device. One single Watly is a standing alone machine, but two or more Watly become a network where each node is self-powered, self-sustained and multi-functional. A growing number of Watly deployed around the world will contribute to form the next big thing, the so called “Energynet”, a global smart-grid, the Internet of Energy in which water and electricity merge with information technology. Watly interacts with people through different interfaces and multi-utilities workstations. Watly is equipped with multiple user-friendly water dispensers, multi-battery charger, 3D printer, solar cooler, ultraviolet rays sterilization chamber, landing pads for drones, LCD touch screens (for end user registration and communications), multiple webcams, digital and facial recognition systems, plus different kinds of sensors. Every time the end user approaches the machine, Watly immediately recognizes him/her and attends to his/her basic needs. Watly collects and reports all types of Human-to-Machine interactions, as well as everything that happens in its proximity. Watly runs on biNu’s efficient data protocol which enables super-fast, data-lite access to the Internet. The system minimizes mobile network bandwidth and allows rich contents to be displayed quickly, even on slow 2G networks. In the event of system failure – for example, software errors or hardware issues – the controlling platform can remotely resolve the problem by rebooting the system or by switching to backup equipments. If the problem is not solvable remotely, the field technician in charge can perform the required maintenance in a few hours by communicating directly with the Watly Technical Center. Watly: the “drone-airport-network” in growing economies. The concept of being connected to the world should not be limited to that of “connectivity”. Connectivity refers to the state of being connected to the internet and its virtual data. Connectivity is also extended to “accessibility” of physical objects such as books, tools, toys or medicines. This consideration is certainly sustaining the recent growth of drones’ industry. Drones are being deployed in the sectors of conservation, agriculture, energy, and emergency services. These applications all involve some degree of automation, whether it be following a predetermined flight path or homing in on a mobile phone signal. Watly’s location is always identified by unique GPS coordinates; sending and landing a flying drone is something quite easy to do, especially in remote locations where streets have no names. Watly landing pad is also a recharger dock. Using it to recharge a drone is as simple as landing on it, since it is compatible with “nearly all existing multi-copters and VTOL aircraft. Built for outdoor use, the extremely weatherproof landing-pad acts as a remotely controlled charging station in a variety of drone applications from farming to surveillance and transportation of medicines and objects. possibile configuration is feasible as well as any power-output (>3000 people and beyond). Watly represents a new paradigm in the relationship people have with technology. We had to completely rethink how water treatment and off-grid electricity systems are engineered and constructed. Finalists of the design award Index 2017. Winners of of the Web Marketing Festival.